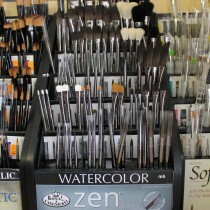 Paint brush sets and single brushes that are perfect for artists using watercolour paints. With a large range of natural hair including professional grade sable or student level red sable hairs. Our range spans beginners quality starter sets to some of the UK's best artists branded brushes. Take a look at our synthetic brush ranges in a variety of sizes and shapes. Shop with confidence and find a great deal on Local Art shop.